Currently in his junior year, Alex is a Physics major at the University of Maryland pursuing his undergraduate degree. Being part of Terps F.I.R.S.T. is truly important to Alex because he himself is a first generation student. He knows and understands the conflicts that most first generation students have to deal with throughout the semester. Alex has identified numerous ways to resolve those conflicts in a timely matter and would like others do the same. He hopes to make college life somewhat easier for others like himself and show that being in college is a great and fun experience. Anthony was born and raised in Antananarivo, Madagascar. He received his Associate’s degree in Business Administration from Montgomery College in May 2014. He is a third-year Hillman Entrepreneur at the Smith School of Business, studying Finance and Information Systems; minoring in Technology Entrepreneurship. He is currently working at Elaunchers, Germantown, as a Marketing Automation Engineer. He has been a Webmaster-Consultant in organizations such as ZalgenLabs and FMK-DC. Music has always been his passion. He has been leading several music clubs and organizations even back at his country. He teamed up with Nathan and Ryan and founded a jazz band, TNR Trio. He has been helping the US-Malagasy community fundraise for its annual Malagasy sport tournament (RSM) through several musical events. 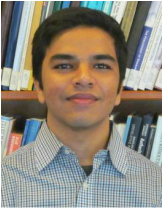 Darpan Shah is an undergraduate student majoring in Computer Engineering at the A. James Clark School of Engineering along with a minor in Technology Entrepreneurship at the University of Maryland. He was born and raised in India, and moved to Maryland in 2012, where he attended Montgomery College for about 2 years, and took variety of courses related to his major. He was recognized at Montgomery College for his leadership spirit and his active participation in the college community and earned a recognition as a Presidential Scholar Award nominee and was also awarded Dr. Harry Harden Jr. Academic Excellence Award. Having joined the University of Maryland recently, Darpan had a lack of proper guidance and was unsure about him being a part of the vast and diverse campus community. However, he overcame those challenges and started being involved in the campus community. Having had this first-hand experience and a strategic solution to that, he decided to do something and create the TERPS F.I.R.S.T.’ as an attempt to provide a better transition to other first generation students providing them better guidance and direction. Iliana Hernandez is currently a Family Science student in the School of Public Health at the University of Maryland, College Park. Iliana has always had the passion for helping others reach their goals. Iliana has actively been volunteering with the Hispanic Youth Leadership Institute, being a mentor and student leader, empowering young students, and in most cases, first generation students, to be motivated and aware of the many college opportunities. Iliana is excited and happy to be a part of FIRST and is ready to mentor incoming transfer students , as a transfer student herself, Iliana understands just how stressful the transferring process may be. Ryan is a Chemical and Biomolecular Engineering student in the James A. Clark School of Engineering at the University of Maryland, College Park. Among Mr. Felix’s greatest achievements is his involvement in undergraduate research. He spent the summers of 2013 and 2014 working in Dr. Daniel Pak’s neuroscience lab at Georgetown University in the ‘Hughes Research Scholars Program’ funded by the Howard Hughes Medical Institute. Recently, Ryan has been the recipient of the ASPIRE research scholarship and is currently working under Dr. Sheryl Ehrman (Keystone Professor and Chair of the Chemical and Biomolecular Engineering Department).